Projector is one of the single weak points that mobile phone manufacturers are never able to satisfy their customers. Now Samsung steps forward and unveils their new Projector camera with the taste of Android. It’s the upgraded version of their previous projector phone. 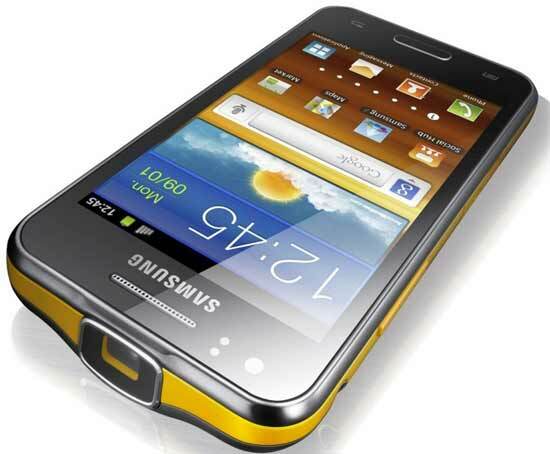 The Samsung Galaxy Beam has Android 2.3 and a 1GHz dual-core CPU inside. It has an integrated projector capable of 15 lumens of brightness, enough to shoot a high definition image that's up to 50 inches wide. There's a dedicated app that activates the projection, letting users pump out video and pictures, as well as interact with games. It has a 2000 mAh battery to keep the party going. Galaxy Beam has 8GB of built-in storage and a claimed 6GB of RAM. There's no word on release date or market availability of this HSPA phone just yet. GALAXY Beam lets users spontaneously share photos, videos or other digital media with family or friends by beaming content stored on the device directly onto walls, ceilings or improvised flat surfaces, so that everyone can share the fun without the need to huddle around smartphone or pad-sized screens. GALAXY Beam's ultra-bright 15 lumens projector allows users to freely share life's memorable moments instantly and in crisp clarity, even in outdoor environments. "GALAXY Beam provides mobile freedom, enabling a unique shared experience around digital content for everyone-anywhere and instantly-from a smartphone as slim and portable as any on the market," said JK Shin, President of IT & Mobile Communications Division at Samsung Electronics. GALAXY Beam is a device borne out of Samsung's insight and innovation, demonstrating Samsung's commitment to providing extraordinary experiences for consumers with products that let them express and fulfill themselves." Video clips, maps, business information, games - a whole range of multimedia content can be beamed instantly by GALAXY Beam on a crisp, high-definition projection up to 50'' wide. The device features a projector-dedicated application which makes it easy to select content and activate projection in a few simple steps. Add a dose of ambience or entertainment to a friends' gathering by transforming any household room or outdoor deck into an instant mini home-theater, projecting full-screen video clips on a ceiling or wall for common sharing, at the touch of a button. Or capture your favorite holiday moments using the GALAXY Beam's 5MP camera, then display a full photo slideshow to family members on a dining room wall while playing accompanying music straight from the device, so that everyone shares the experience. For young users who depend on constant, immediate socializing of digital content and entertainment, GALAXY Beam introduces a new way of sharing. It becomes much more than a phone-a handy digital tool, deployable anywhere, which can add visual entertainment to a simple street gathering, set the mood for a small party, or simply turn life's moments into something personally and immediately sharable. With GALAXY Beam, a birthday or anniversary party can be enlivened in seconds by sharing YouTube or Hulu music videos straight onto a ceiling or door. Likewise, students can collectively share videos or study-work in any dormitory room or student lounge, turning group study into a whole new interactive experience right from a desk table or from the palm of their hands. GALAXY Beam is also ideal for action-packed interactive gaming: Users can upload their own games or choose from over 1,000 games available via Game Hub, Samsung's dedicated virtual gaming store, then project games to co-players or observers to turn gaming into an unbeatably interactive, shared experience. Additionally, GALAXY Beam is convenient tool for mid-sized business workers. An estate agent can beam images of candidate properties to customers as they tour them; or an architect can display draft concepts or designs to co-workers on the spot at a building site or public location. Samsung Electronics Co., Ltd. is a global leader in semiconductor, telecommunication, digital media and digital convergence technologies with 2011 consolidated sales of US$143.1 billion. Employing approximately 222,000 people in 205 offices across 71 countries, the company operates two separate organizations to coordinate its nine independent business units: Digital Media & Communications, comprising Visual Display, Mobile Communications, Telecommunication Systems, Digital Appliances, IT Solutions, and Digital Imaging; and Device Solutions, consisting of Memory, System LSI and LCD. Recognized for its industry-leading performance across a range of economic, environmental and social criteria, Samsung Electronics was named the world's most sustainable technology company in the 2011 Dow Jones Sustainability Index. For more information, please visit www.samsung.com.